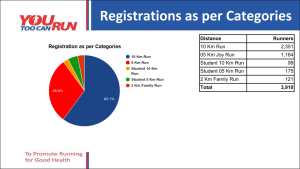 India’s only fully featured and completely serviced running event technology platform”. We are a mass participation endurance events specific technology platform. We back this with a best-in-class support service team. We are not a generic event ticket selling payment gateway. 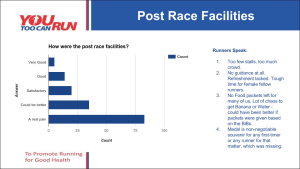 Our more than a decade of in-depth involvement with the sport of running ensures that we have deep domain expertise that gives your event the edge. 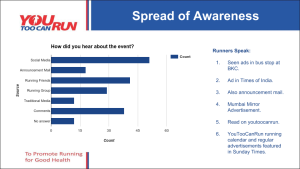 Our network into the sport involves the who’s who of running in the country. We are fully featured and keep on adding to the list. Our more than thirty features ensure that no generic event registration offering can match our specialisation. Our suite of innovative tools will help you through the entire lifecycle of your event. We command the largest market share in sporting events and in the calendar year 2015 supported 87 events with over 1,20,000 participants. – Help you design the event features based on current market conditions. Our finger on the pulse of the market cannot be matched by others. – Establish a marketing plan to make your event grow and support it fully. – Custom design the form to meet your event specific features. Can give you an unparalleled edge. – Sending marketing mailers and SMSes without any limits. – Our largest backend database of past participants ensures filling of data with minimum hassles by pulling previous data. A participant delight. – Recognise and offer ‘Loyalty Privilege’ discount to repeat participants. They will love you. – We provide swipe card machines for offline registrations. We also will enter your paper based applications. No participant is ever denied entry. – Prepaid cards with your branding for direct sales to bulk organisations. – Promo codes for customised discounts ensure tracking of marketing channels. – Customised workflow solutions for corporate enrollees. – Participants can check application status and resend registration email feature. 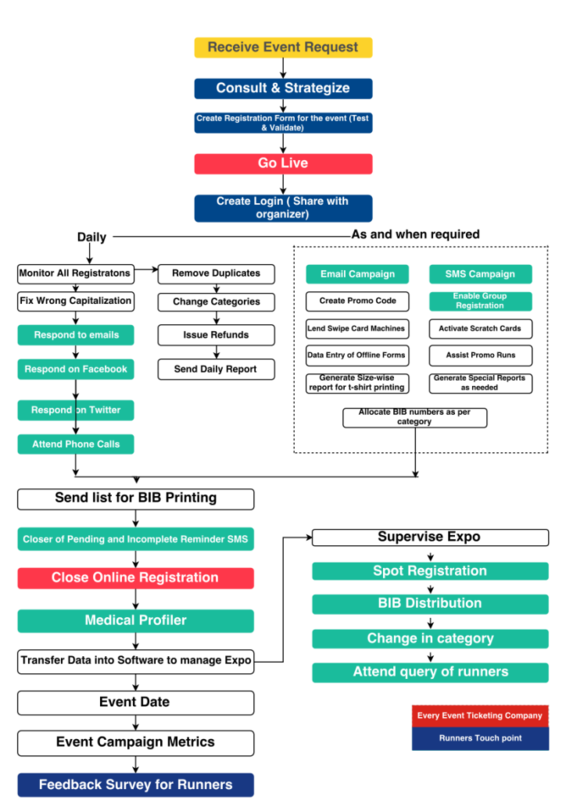 – ‘Reserve my bib’ feature for event notifications services. Help build the pre-event lead pipeline. – Running helps raise the largest amount of charity worldwide. Our alliance with Ketto.org is aimed to help your sporting event work towards social good. The seamless integration ensures that participants who are inclined to use your event for raising charity can do so with minimal efforts in creating their customised pledge pages. – We recognise your needs may be unique.– We send you a daily MIS Report by email with your desired customised format. We recognise your needs may be unique. – All email queries are answered on ‘same day’ basis. A second round is escalated with a phone call to the participant, eliminating email ping pong. – Answering routine posts on the Facebook event page. – Chase abandoned registrations and ensure conversion. Approximately 10% enhanced revenue realisation. – Capitalise “ravi kumar” to “Ravi Kumar”. Ensures neat communications in future. We care for your image. – Customised MIS reports for specific purposes. for eg, you want to place the t-shirt order. 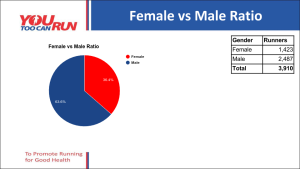 a customised report would specify “size” & “gender” details. – Monitor marketing efforts and track responses. Send marketing emails as needed…remember they are unlimited. – Customised event promotion activations. 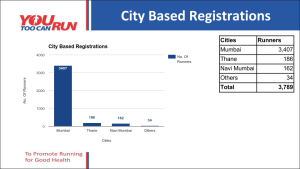 – Automated Bib allocation at the time of registration as per predefined bank of numbers. 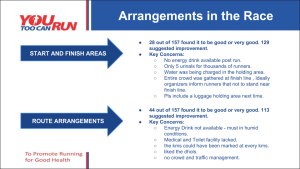 – Bib number allocation at the close of event based on different categories.